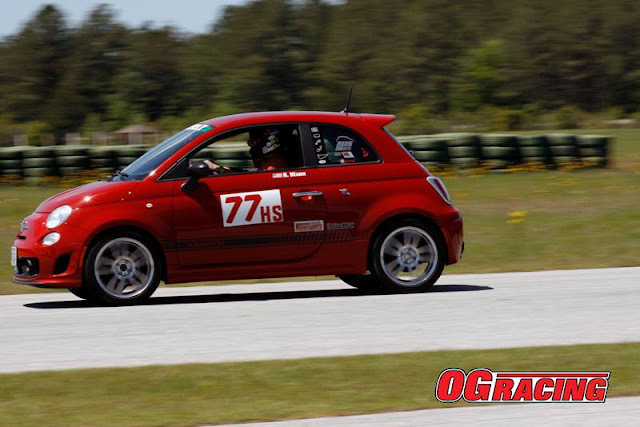 Right here on this blog on January 3rd of the year 2017, the NMS-North squad listed their goals for the FIAT Abarth, so now that the season has finished up and the results are posted, let's take a look at how things turned out! Was our crystal ball right on the money, and if so, why doesn't it work for bazillion dollar jackpot lottery tickets? Were the team directors overly optimistic regarding the FIAT driver's abilities, or is that just a silly question for someone driving a FIAT? Preseason Goal #1: "Win my class with the Tidewater Sports Car Club." --Nailed it! This turned out to be easy mostly because the fast drivers in HS class during 2016 didn't compete in enough events in 2017, so once again, the FIAT took 1st place in a class without other drivers meeting the minimum number of events. But, first place is still first place! I missed two of the nine events myself, but that worked out fine since only the best seven events count. 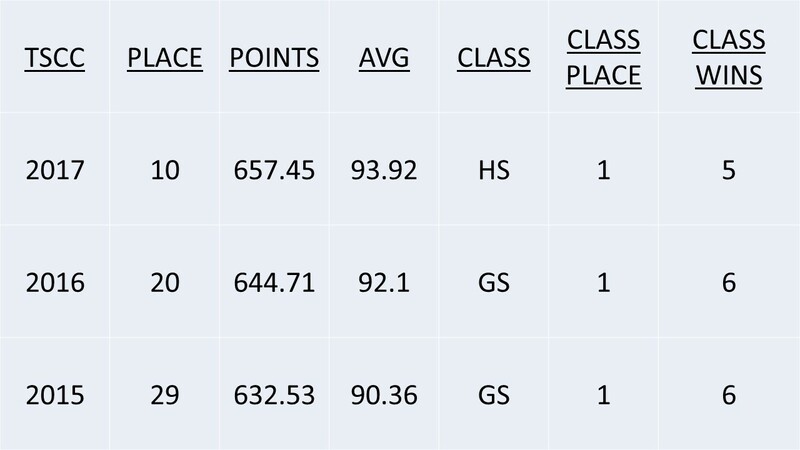 Preseason Goal #2: "Move up from 20th to at least 15th in the overall TSCC PAX points championship." --Nailed it! After November's event, and the end of the season I ended in 10th, so I'm very happy with that placing. Following October's event I was sitting in tenth overall, and guaranteed to finish no worse than 11th! That was better than I had been hoping for, since this club is chock full of fast drivers. To be honest, I think some of them didn't compete in enough events this year since we were limited to a smaller location at Pungo, but, well, you've gotta play the game if you want to win, so I'm not going to worry about things (like other drivers) that are beyond my control. There were almost 200 drivers that competed this year, but again, you've got to enter enough events to score near the top, and only 29 entered enough events to be listed in the final standings. Driving in the rain? Just add Gore-Tex! Preseason Goal #3: "Improve my average points per event from 92.10 to 94.0." --Missed it by a hair! According to my math, I averaged 93.92, and since events are timed to the thousandth of a second, maybe I could round that up to 94 and claim victory, but no, I didn't hit 94 per event. Still, missing it by 0.08 of a point is very, very close! Instead of improving the average by 1.90, I only managed to improve by 1.82 points per event. Preseason Goal # 4. "Upping the average points per event would bump my total points (in the best 7 events) from 644.71 to 658, and from there maybe the top 10 will be in range." --Result: Well, this is pretty much based on Goal #3, so since I didn't achieve that one, I didn't quite make this one either. However, with a final score of 657.45, my total is so close to 658 that I'm still feeling good about it. No excuses, but just maybe I could have hit the target if I didn't miss two events this year...AKA: the Coulda-Woulda-Shoulda-Hypothesis-Excuse! Preseason Goal #5: "Those are the tough goals; the easier ones will be to drive safely, have fun, and find some other events and track days to drive in too." --No doubt, I really had fun, went to a bunch of car shows, Cars and Coffee events, the open house at Moss Motors, toured Fantomworks in Norfolk, drove three autocross events with the Old Dominion Region of the SCCA (27th overall out of 72 drivers), and met goal #5 with room to spare! Safety wise, I kept the car in good shape, upgraded the brake pads with Brian's help, replaced the brake fluid, threw two new tires on it at the start of the season, and always used seat belts and a helmet when competing. 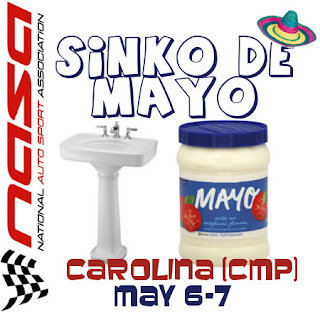 It would have been fun to do another autocross down in South Carolina, but I just couldn't squeeze that into the schedule with all the other events, moving, and job searching going on this year. However, I did make it to the state of SC, and during the two day HPDE track day at Carolina Motorsports Park I had a blast and was able to drive 9 sessions on track with an instructor while camping out with Brian and Team Coronautski. Oh, and mostly I learned how bad I am at track driving and what areas (all of them) I need to improve. 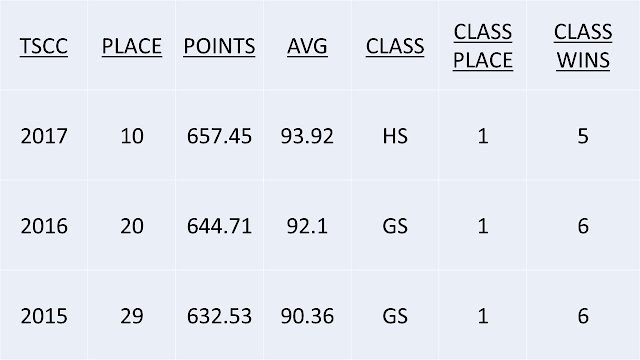 In addition to this year's autocross season, here's my results from all three years with the Tidewater Sports Car Club in Virginia. I'm very happy to have seen some improvement each year, as you can see in the chart below. They say that good public speakers don't read their slides to the audience, so I'll let you read it yourself!